The Art Deco Society of New York celebrates the 85th anniversary of the jewel in the crown of New York City’s skyline: the Chrysler Building. 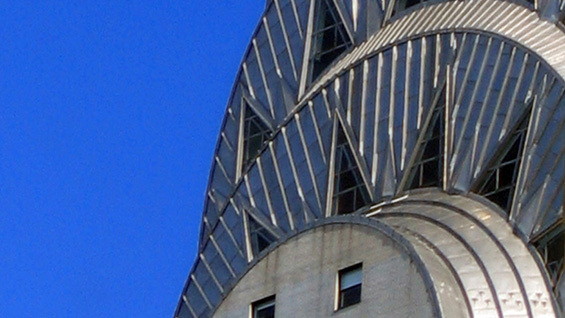 David Stravitz, author of The Chrysler Building: Creating a New York Icon Day by Day (2002), will show us never-before-seen photos that show this American icon in exquisite detail and discuss how this Deco skyscraper quickly became the symbol of big city glamour, excitement and style. Its cloud-piercing spire and gleaming, steel-clad ornamentation depicting gargoyles, hubcaps and the winged helmets of Mercury, came to represent the thrill of the Machine Age at its most exuberant. After David’s captivating illustrated talk, ADSNY invites you to partake in our festive holiday celebration featuring seasonal treats and refreshments. This event is ticketed. $35 to Art Deco members, $50 for the general public. FREE to Cooper Union students and faculty but advanced registration is required. Email your name and the event to Events@ArtDeco.org to RSVP.